Exciting Update! Our Servo Bases now feature Quiet-Startup! The Quiet-Startup feature nearly eliminates the jumping and thrashing about most servo motors go through when powering up. motors are a great way to operate turnouts and create animation. These Servo Motors are an inexpensive flexible alternative to traditional switch machines, and the best way to add animation to your layout. 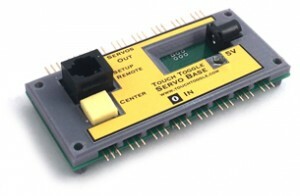 Touching each Toggle moves a servo from one position you’ve set to a second position. A second touch moves it back. Each servo moves to unique positions at just the speed you’ve set. We offer the Base alone or in our packages with Touch Toggles and a output Servo Control Base. Choose the style of base and Touch Toggle that suits your design from the menu below. We also have packages with Mini-Cup Toggles. These self-trimming fascia mount Toggles mount in a 1″ hole! A 5 volt Power Supply. Stalled or starting servos can draw lots of power, so a 2 amp power supply is needed for each Servo Control Base. One Setup Remote tool to adjust your servos for optimum operation. You’ll need just one for the whole layout. Our easy to use Setup Remote helps you to quickly set each servo to the exact positions and speed setting you need. One Setup Remote Cable. The Setup Remote uses a standard DCC cable (RJ11 – straight through wiring) to connect to the base. If you don’t have one we stock Setup Remote Cables in 7 and 25 foot lengths. Servos. Use your own servos, or add our Servos to your packsge to deliver all the operators you need for the system. Servo Mounts. 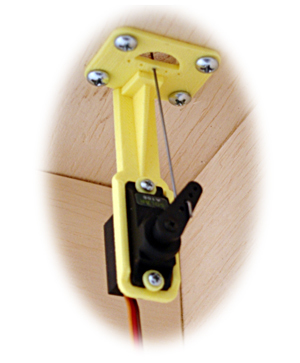 Install the servos with your own mounting arrangement, or add Servo Under-Table Mounts or Servo Well Mounts to provide the easy-to-install mounting you’d like. This note describes most servo control systems and our systems before April 2017. Our new Quiet-Startup feature has eliminated this behavior in almost all situations. The installation recommendations are still good practice, since servo motors and their controllers can at times be unpredictable. Most servos will move about wildly on startup. This thrashing about is a characteristic of the servos not the controller. Make sure nothing will be damaged when the servo tries to move outside of it’s pre-set range. In most cases this is as simple as adding a spring or springiness to the linkage. Be sure that a sudden movement doesn’t move your turnout or break the throw rod. Add a V or Z bend in direct push rod linkages to avoid problems. If you have further questions contact Kevin Hunter at kevin@berretthill.com or 443 527 6320.